(2) political and economic profiteers can usurp and profiteer and remake the world to their best interests (e.g. Afghanistan, Iraq, Burma, New Orleans). (3) The current economic crisis is just another economic shock under the rise of disaster capitalism. This puts all the unemployment, foreclosures, "border line criminal" bailouts of the last year into perspective: The bailout has been designed to impoverish us and disempower us while we suffer the shock of unemployment and foreclosure and bankruptcy. Also, Matt Taibbi searing article on Obama's recovery for the rich is in this month's Rolling Stone. "As credit card companies face rising public anger, new regulation from Washington and staggering new rates of default and bankruptcy, FRONTLINE correspondent Lowell Bergman investigates the future of the massive consumer loan industry and its impact on a fragile national economy. In The Card Game, a follow-up to the Secret History of the Credit Card and a joint project with The New York Times airing Tuesday, Nov. 24, 2009, at 9 P.M. ET on PBS (check local listings), Bergman and the Times talk to industry insiders, lobbyists, politicians and consumer advocates as they square off over attempts to reform the way the industry has done business for decades." The Bellingham Herald, the Wall Street Journal, Warren Buffet, the NABE are full of rehetoric this morning that might make the casual reader think that the housing market still lives and that an increase in some economic statistics might be evidence of a recovery. In reality, all these sources are practicing "hopeful journalism". It is not bad journalism. If you tell the human mind that life is getting better, there is a chance to create optimism. This is important. Optimism greases the world of sales and investment. Back now, however, to the hard truth about our country's weak fundamentals. With the FED and the TREASURY continuing to purchase billions $$$ of mortgages, with foreclosure and deliquency rates continuing to rise, housing prices continuing to drop and unemployment (both U-3 and U-6) continuing to rise, there really is little reason to hope for anything a reasonable person might call a recovery. Proclamations that the recession is over mean nothing to those caught in the "jobless recovery". The unemployment rate is high enough that the members of Congressional Black Caucus derailed democratic efforts at financial reform, claiming that the bill does too little to stop continued unemployment. Looking at the graphs below, you can understand why. 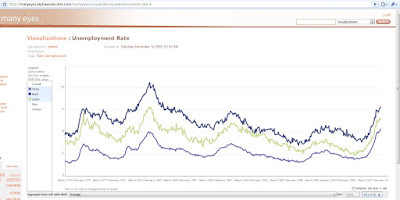 More information on why this unemployment trend may not abate can be found by listening to Robert Reich , Meredith Whitney and Doug Noland. "The Great Disconnect Between Stocks and Jobs"
"Obama, China, and Wishful Thinking About American Jobs"
Meredith Whitney gives a great interview on the weakness of American credit and banking fundamentals. "It is my thesis that there is no alternative than a major transformation of the underlying structure of the U.S. economy. In simplest terms, we must produce much more, consume much less and do it with a lot less Credit creation. The objective of current policymaking, however, is to quickly rejuvenate housing and asset prices with the intention of sustaining the legacy economic structure. Zero interest-rate policy is key to this strategy. The objective is to push savers out to the risk asset markets, as well as to transfer returns on savings from the savers to be used instead to recapitalize the banking/financial system. If this reflation is unsuccessful, the household sector will find itself with only greater exposure to risky assets. No only is the current course of policymaking unjust, I believe it is flawed. The nation’s housing markets will remain rather impervious to low rates, while the household sector is punished with near zero returns on its savings. At the same time, monetary policy will continue to play a major role in dollar devaluation and higher consumer prices for energy and imports. Financial sector profits have already bounced back strongly, but there is little market incentive to direct new finance in a manner that would fund any semblance of economic transformation. The focus remains on financing the old structure. Indeed, I would argue that the current course of policymaking and market interventions only work to delay the unavoidable economic adjustment process." "Good Evening, this is the local Whatcom County Transit Authority. We have a survey we are asking of members of your household between the ages of 16 - 29. Are you between the ages of 16 - 29?" "Unfortunately not," I truthfully replied. "Is there anyone in your household between the ages of 16 - 29 who would like to take our short survey concerning Whatcom County Transit?" "No, there is not," I truthfully replied again. "Thanks so much for your time!" Denied my chance to talk about Whatcom County Transit tonight, I will admit I don't really have much to say right now about the library cuts, the WTA cuts, the recently proposed jail and probation cuts. Each would have there own specific issues. But in general, these cuts in government services are what happens to counties and cities when local economies collapse. It is the hallmark of desperate contractions in economic revenue that overused city services (like libraries, transport, jails) get slashed when they appear to be needed the most. In effect, economic contractions shrink governments and shrink power. They also shrink employment and because government is such an important part of total economic activity, these cuts amplify the contraction. Clearly, we will not recover the sales, property, and B&O taxes we need to restore or expand government services unless we redirect all our efforts toward economic growth. In this case, that means growing jobs. “Despite the recession ending in mid-summer, the decline in mortgage performance continues. Job losses continue to increase and drive up delinquencies and foreclosures because mortgages are paid with paychecks, not percentage point increases in GDP. Over the last year, we have seen the ranks of the unemployed increase by about 5.5 million people, increasing the number of seriously delinquent loans by almost 2 million loans and increasing the rate of new foreclosures from 1.07 percent to 1.42 percent,” said Jay Brinkmann, MBA’s Chief Economist. The visits remind me of how national and international Bellingham's economic reality probably is - an important subject for another post. (2) the importance of economic justice. They may also start wondering why all their wealth has disappeared and who has that wealth now. The first thing middle-class America needs to do is recover their anger and self-respect. President Obama will host a Forum on Jobs and Economic Growth on December 3rd. Make sure to participate! "Profit is not satanic," the CEO of Barclays recently proclaimed. "Size is not necessarily evil," asserted the head of Deutsche Bank. But leave it to Lloyd Blankfein, CEO of Goldman Sachs (and the world's highest-paid banker -- $68 million in 2007 alone) to combine self-pity with self-adulation in a grandiose PR effort to reposition financial thieves as paragons of social altruism. "I know I could slit my writs and people would cheer," he acknowledged in an interview published Nov. 8 in London's Sunday Times. But, he said of himself and his big banking brethren," We're very important. We help companies to grow by helping them to raise capital. Companies that create more growth and more wealth. This, in turn, allows people to have jobs that create more growth and more wealth. It's a virtuous cycle." WASHINGTON, DC- The Obama Administration announced plans today to hold the Forum on Jobs and Economic Growth on Thursday, December 3rd at the White House. The forum will be an opportunity for the President and the economic team to hear from some of the best and brightest CEOs, small business owners, and financial experts about ideas for continuing to grow the economy and put Americans back to work. “During these difficult economic times, we have a responsibility to consider all good ideas to encourage and accelerate job creation in this country. At the forum next month, I am looking forward to hearing from the private sector, from CEOs and small business owners and from Americans struggling to make ends meet on how we can work together to create jobs and get this economy moving again,” said President Barack Obama. For Whom the (Trading) Bell Tolls: Reforming Wall St. to Protect Main St.
And while the top was surfing the big wave, the middle class was treading water and the poor were drowning. Despite years of economic growth and solid productivity in the last economic expansion, the median income went nowhere and poverty rose. Incredibly, according to Census Bureau data, real median household income in 2008 was about $1,000 lower—that's right, I said lower—than it was a decade before. "At the same time, the Treasury continues to be fixated on keeping banks afloat. The Administration's mortgage mitigation efforts are lagging. Small businesses are starved of credit. The White House has announced a "jobs summit," which is better than nothing but not nearly as good as pushiing immediately for a larger stimulus, a new jobs tax credit, and a WPA-style jobs program. The Fed and the Teasury have, in effect, placed a huge bet on a recovery driven by asset prices. That’s a bad bet. The great disconnect between the stock market and jobs is pushing stock prices way out of line with the real economy. This isn't sustainable." Robert Reich also has a great talked entitled "How Unequal Can America Get Before We Snap?" You can also send comment at http://www.utc.wa.gov/comment referencing docket numbers UE-090704 (according to my utility bill). Many residents of the Pacific Northwest think the Macquarie buyout will bring permanent annual increases in electricity to the Northwest which generally has had low electrical rates due to significant hydro-power generation capability. Some counties are interested in exercising their right to form a Public Utilities District. Enclosed (far) below are some links concerning the Macquarie/PSE takeover and the PUD option. Whatcom County has a PUD (Whatcom PUD1) that was established in 1937. It provides a substantial amount of power to industrial customers and owns physical assets in Whatcom County. "The City of Palo Alto Utilities (CPAU) is the only municipal utility in California that operates city-owned utility services that include electric, fiber optic, natural gas, water and wastewater services. " This enables the city of Palo Alto to do something quite remarkable. Fund city income with ownership of municipal utilities. "One of the founding principles of these early pioneers was that the utilities must show a financial return to the community. This has continued to be a priority. In the most recent fiscal year, the electric, gas, and water utilities provided millions in financial support to community services such as libraries, parks, police and fire protection. These contributions to the community do not occur in areas served by private power companies. This makes Palo Alto a unique place to live and work." While I lived in Palo Alto with this house of graduate students, California was suffering from a continuing and later famous energy crisis that eventually ended up virtually bankrupting the state, the top utility, resulting in the recall of the then Democrat governor and the election of a Hollywood movie star to replace him. The city of Palo Alto, however, was not suffering from an energy crisis. You see, CPA, at that time (and probably still) owned a dam in California. It was making such a profit selling its unused electricity, that (while I was there), it was returning to Palo Alto utility customers/residents a check instead of a bill. Receiving that check was an experience I never forgot. Local editor Tim Johnson has published an article I have submitted - "Four Futures: BLEAK OUTCOMES LOOM FOR WHATCOM’S ECONOMY" - in this week's issue of the CascadiaWeekly. The article starts on page 6 and continues on page 33. I promise more articles on economic forecasting and use of recovery monies in Whatcom County. :-). Thanks Tim! With 61,027 counted...by leader...by participation. These are 'unofficial' final tally results. All figures and analysis below are preliminary and may change. The fifth round of ballot counting continued a pattern of conservative advance paired with increased voter 'fall off' for the eight county races. The respective 'fall off' percentage for the sum of all votes as the five rounds of ballot counting progressed became: 90.90%, 90.80%, 90.58%, 89.92%, 89.63%. The 'fall off' percentages for the races as measured per each round are much more dramatic. Some races lost almost 11% in voter participation rates due to 'fall off' (preliminary figure) as measured between the first and last rounds of ballot counting. It appears that 'fall off' rates of almost 6% (between the first and last rounds of Council 1A ballot counting) may have been responsible for McShane's loss and Kershner's victory (preliminary figures) . This victory was demarcated by less than 400 votes. Only 71 and 1033 gathered more than 50% of total registered voter participation. 1033 had the largest margin of victory (10.6%). In reality, it most probably should be considered exceptional that 1033 gathered 26,023 votes in favor, despite being opposed by some members of both parties. These are 'unofficial' final tally results. Final certification will not take place till the last week of November. The 2009 General Election Voter History will not be available until December 1st at the earliest I have been told by the Auditor's office. With 61,027 counted...by leader...by participation. All of the county wide races took a decided turn toward conservative voting in this fourth round of ballot counting. Both 1033 (NO) and Initiative 71 (Yes) had their leads shrink for the first time. McShane, who had increased his lead in the first two rounds of ballot counting, has been overcome by Kershner. The number of possible votes for county wide races divided by the number of votes actually cast for county wide races continues to shrink with each round of ballot counts. Another interesting trend is that the spread in "fall off" percentage between the race that gathers the most %Total Registered Voters (71 for all four rounds of ballot counting) and the race the gathers the least %Total Registered Voters (Port 2 for all four rounds of ballot counting) widens sequentially for each round of ballot counts. The breadth of the "fall off" increases with every successive round of ballot counting. unemployed has more than doubled to 15.7 million. part time in October who would have preferred full-time work. workers in October was 808,000, up from 484,000 a year earlier. they believe no jobs are available for them. With 46,447 votes counted...by leader...by participation. I am tracking an interesting trend. The percentage of sum voter participation for all the county wide races (about 90%) is decreasing with every new batch of votes counted. It will be interesting to see if that trend holds up. 1033 and 71 continue to strengthen their percentage leads, as they have every voting round. There are at least 61,294 ballots returned to date. With 40,641 votes counted...by leader...by participation. County-wide races with 40,641 votes counted...by leader...by participation. With the exception of 1033 and 71, both of whom continue to strengthen their leads, none of these races are over. 1033, 71, McShane and McCauley strengthened their leads. Despite that, every current lead is up for grabs. For example, there are ~1600 votes separating Knutzen/Caskey-Schreiber with a mininum of 15K more to count. We could easily see 70K votes. With 37,550 votes counted...by leader...by participation. These are the county-wide races sorted by lead with 37,550 counted. These are the county-wide races sorted by participation with 37,550 counted. What reason do you have for not voting tomorrow? today? Do you think your vote won't count? Do you think your vote won't help? Do you think you don't understand the issues? Do you think politics is too dangerous to involve yourself in? Do you think you are too busy? If you vote, even if you send in that secret ballot blank, you still affirm your power as a member of the electorate. You are still someone the body politic has to include in it's decision making calculus. You count. If you vote, you tell the people in power that you will use your vote as needed. This is a surprisingly powerful statement. A turnout as robust as the 2008 general election would tell every politico in Whatcom County that the electoral equation and profile has changed, permanently. It would send a message about the age range and needs of the electorate that could not be ignored. Participation in the vote defines generations and their demands. So tomorrow(Tuesday November 3, 2009) VOTE!!. Tell the world that you matter.